If you’re like me, you are always looking for a simple way to take an ordinary thing and make it a little better. AND… if you just want to look good in the kitchen, scroll to the bottom to see what’s in the mail. It’ll make you look like the PRETTIEST CHEF EVER!! Do you ever have those nights when you just want an easy, delicious dish that’s quick to make? I definitely do; sadly more than I’d like to admit lately. But, on a good note, my design business is going so well! (Thanks to some amazing clients and friends!!) And, I had this post in the queue since last year. My go-to dinner after a looong day is dressing up a frozen pizza. We probably have been eating too much of this but with all the holiday craziness I will admit this has been a go-to dinner. The steps are as easy as 1-2-3! 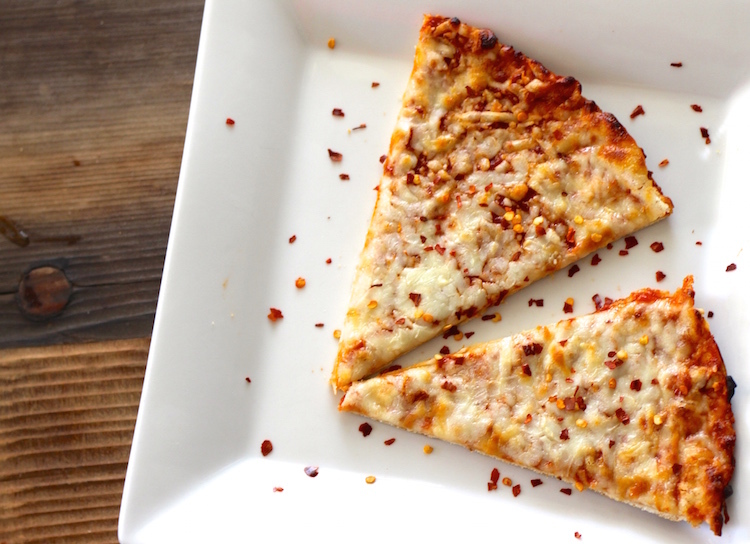 Cook your favorite frozen pizza (or homemade!) in the oven as usual. I always like to kick mine up a notch by adding red pepper flakes too. 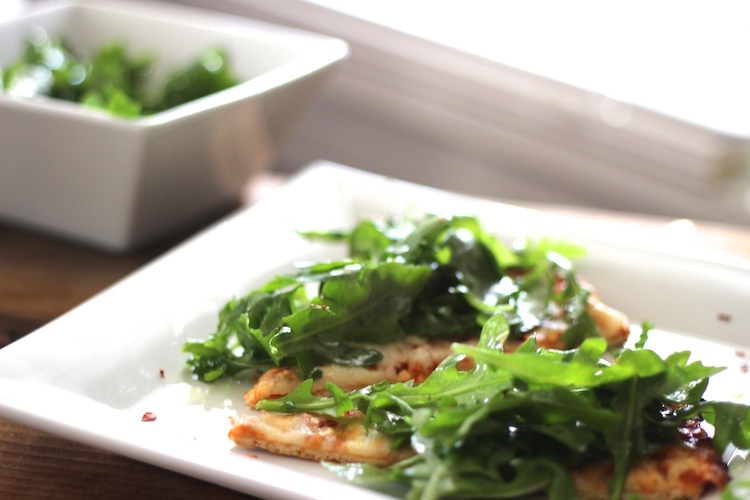 Mix up arugula and Grapeseed Oil in a bowl and sprinkle on top of the pizza. Olive oil works too! 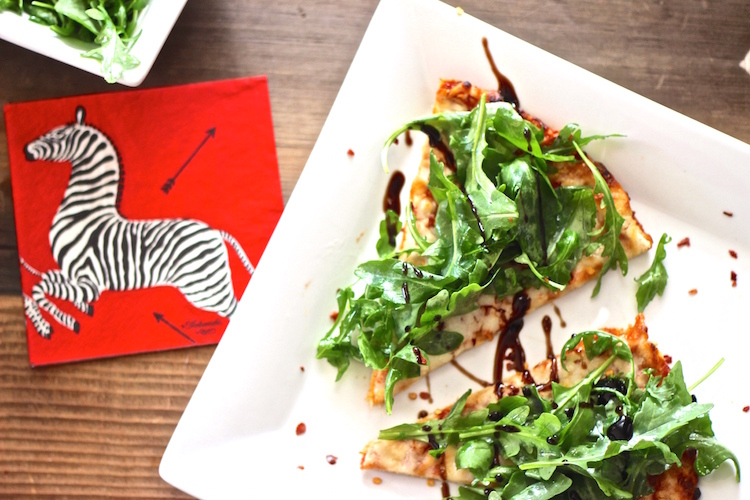 Drizzle with balsamic. 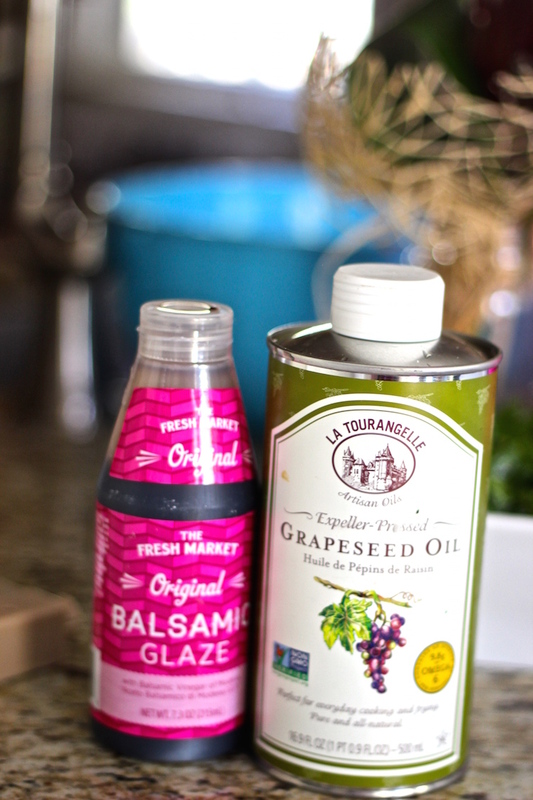 I keep it really simple and use a balsamic glaze from our local grocery store, The Fresh Market, but here is a great recipe for a homemade balsamic reduction which is just as delicious :). 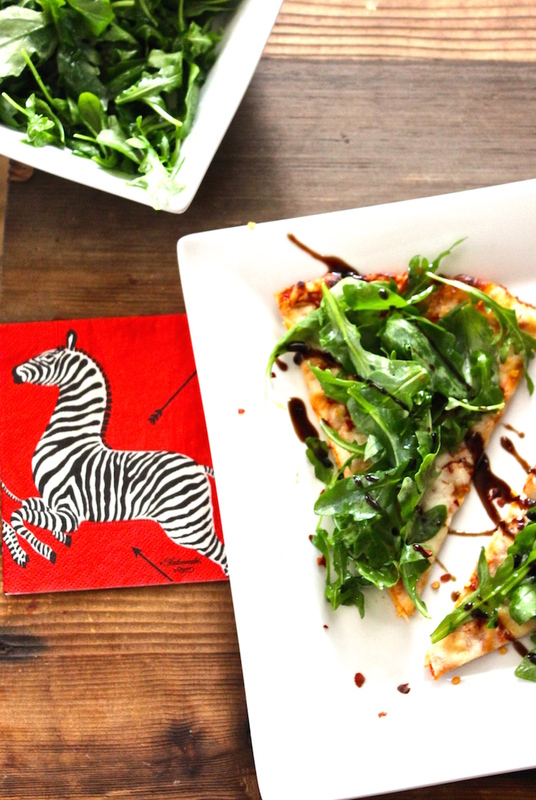 There you have it – an easy way to jazz up a frozen pizza in 3 simple steps! What are your favorite tricks in the kitchen? Please share! OH!! And I won a giveaway which I’m dying to share with you —– it’s the cutest thing ever!! I won this adorable apron in a giveaway from this adorable Chicago based Parisian Party company!!! It’s in the mail now! Plus I had the inside scoop this weekend on the making of the apron… AND SO ECSTATIC! Yum! We do a frozen pizza night whenever we get all cooked out. 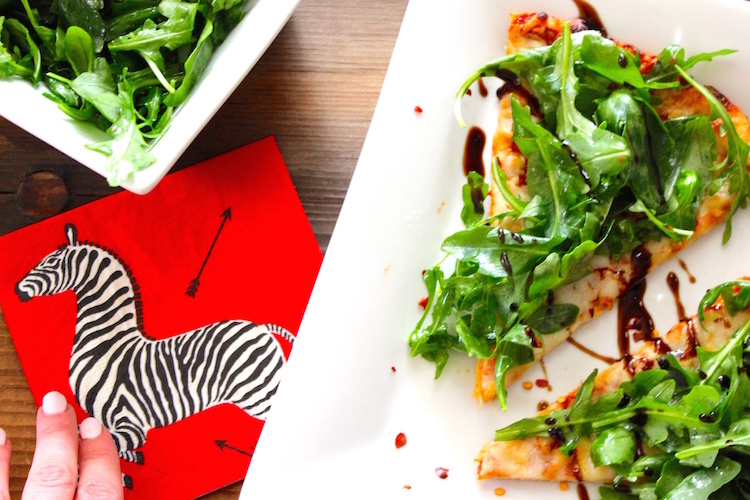 We are big arugula fans, so we will give this a try.! Awesome Josie! Let me know what you think! And you’ll have to share some of your secret recipes with me… I’m still drooling over your sweet potatoes! John made this for me on our last pizza night. It was delicious! Maybe one day I will divulge the secret sweet potato recipe ;). Great idea on the truffle oil! I’ll have to give that a try 🙂 BTW, you were part of my inspiration for today’s blog post on bathrooms!